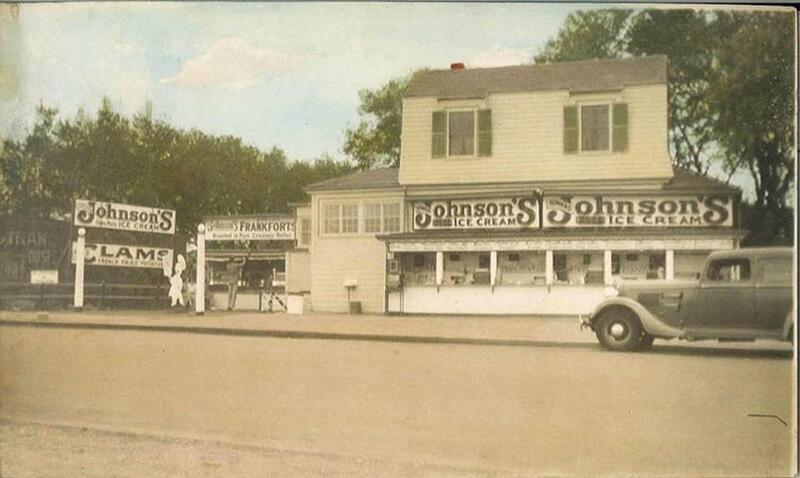 It all started with the Howard Johnson’s ice cream stand on Wollaston Beach in Quincy. Excerpted from “A History of Howard Johnson’s: How a Massachusetts Soda Fountain Became an American Icon,” by Anthony Mitchell Sammarco to be published by The History Press on Aug.13. In the mid 1920’s Howard Johnson began producing a rich, creamy ice cream that had a doubled butterfat and was flavored with all natural ingredients with the important fact that the quality and taste of the ice cream never varied. This 28 flavors of ice cream brought a steady stream of loyal customers to the store, which was later augmented by grilled frankforts and fried clams. His ice cream stand on Wollaston Beach in Quincy, a small stand attached to a house which he leased for $300.00 for the summer, proved so successful that the next summer he was able to open an ice cream stand at Nantasket Beach in Hull, Massachusetts and at Revere Beach in Revere, Massachusetts. It was said that Howard Johnson “sold $60,000 worth of ice-cream cones that [first] summer — 14,000 cones on one Sunday — and there’s good reason to suppose that when the summer visitors went home they kept up the argument about the flavors” and thus a word of mouth publicity spread compliments on his business. In 1929 he was to open his first restaurant in Quincy Square’s Granite Trust Building, the only high rise building in the city at that time, and strategically located at the busy intersection which faced Quincy City Hall and the famous Church of the Presidents. Here, he opened an elegantly appointed restaurant that served traditional New England fare throughout the day, with daily specials that attracted business people at lunchtime, diners in the evening as well as families. 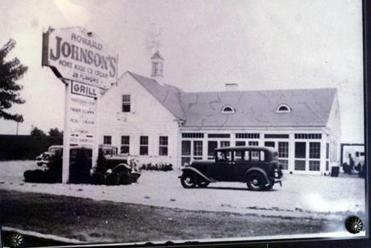 Howard Johnson’s restaurant was strategically placed and well located at the junction of Chestnut, Granite and Hancock Streets in the thriving shopping and business district of Quincy Square. In 1929 Eugene O’Neill’s infamous play “Strange Interlude” had been banned in the city of Boston by Malcolm Nichols, the mayor, and the no-nonsense New England Watch & Ward Society, and was moved by the Theatre Guild to Quincy, in the Quincy Theatre on Hancock Street directly opposite Howard Johnson’s new restaurant. As the play was extremely long, averaging just over five hours, there was a scheduled dinner break that allowed the hungry theatre-goers to flock across the street to Howard Johnson’s new restaurant where dinners were served at a dollar a plate. The restaurant was immediately a great success with thousands of people from Boston coming to see the play that season but the impact of the Great Depression in the fall of 1929 caused severe problems with both patronage and the credit line his business depended upon, which was severely restricted by his bank. The concept of franchising his name was a fairly new business idea but Johnson reasoned that if he let a franchisee use the now recognizable Howard Johnson name, and they purchased all food and supplies from him provided from a central supply commissary, he could charge a fee in exchange of the use of his brand or the logo, “Simple Simon and the Pie Man.” The franchise concept was immediately successful and Johnson has been justifiably thought of as the “Father of the modern restaurant franchise” in the United States. Howard Johnson restaurants, in attractive Colonial Revival buildings sporting colorful and eye-catching orange porcelain tile roofs, projecting dormers, illuminated cupolas and turquoise blue shutters, which were said in Reader’s Digest in 1949 to be the epitome of “eating places that look like New England town meeting houses dressed up for Sunday,” began to be franchised throughout the New England area. The aspect of franchising was a sort of licensing in which the franchiser agrees to provide to the franchisee with the use of the name, logo, standardization of the operation and products for a sum of money or a percentage of the net profits. Anthony Mitchell Sammarco grew up in Dorchester looking forward to the Clamboree, an all-you-can-eat clam night at the drive-in Howard Johnson’s. Not only did he franchise restaurants, but also ice cream stands that were opened throughout the metropolitan Boston area. By the late 1930’s, Howard Johnson recognized the ascendency of the automobile and the ability of the public to travel longer distances for both pleasure as well as business and these newly franchised restaurants and ice cream stands began to be opened on major roads — preferably at major intersections — and interstate highways where the travelling public would be assured of consistently high quality foods that was the same served locally or in Maine or Florida. Opened in the summer of 1935, the restaurant in Orleans on Cape Cod was the first of the franchises and was opened by Reginald Heber Sprague, a lifelong friend, former school chum and confidante of Howard Deering Johnson. This franchise was strategically located at the prominent intersection of Route 6A and Route 28 on a portion of the Sprague Estate and was seen by the travelling public using either road as they passed; the opening of this franchise was almost immediately followed in the next few weeks by the restaurant opened in Dorchester. Located on the Old Colony Parkway (now known as the William T. Morrissey Boulevard) at the foot of Pope’s Hill near Neponset Circle, those travelling south from Boston in the two decades before the Southeast Expressway was built in the mid 1950’s passed the orange porcelain tile roofed restaurant, and with ample parking spaces and a solid tradition of quality foods and ice cream and family friendly service, was a major attraction for the travelling public.